Often, I have no idea if something is a good idea or not, but I'm intrigued enough to at give it a shot. Many a 30 day trials has ended up as a permanent part of my life because I like the results so much. Here are a few examples of trials have have been very successful. Becoming A Runner: In the fall of 2003 I was the possessor of a newly trim body, having shed much of my weight over the previous year. One day I ran three miles on a whim, the longest I'd ever been able to run due to how overweight I'd been, and I felt euphoric and free...and sore. I committed right there to run at least 3 miles every day for a month. At first it was a bit challenging because I had to start getting up early to run before classes, and for awhile I was running in an old pair of Vans, but I worked it out. I ran every day that month, and I felt so fantastic doing it that at the end I committed myself to run at least 3 miles every day for an entire year. I didn't miss my run on any of the next 365 days, running through rain, blizzards, and searing heat. By the end I was truly a runner. I'd laid down the habit so successfully that when I finally took a few days off I felt strange, and quickly retreated to my running habit. That's how you know that you've successfully implanted a positive habit, by the way - you retreat to it when stressed or feeling poorly. 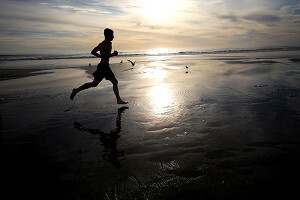 Because of my running habit, it was fairly easy to ramp up to running a marathon, which I started training for in 2008. You can read about that here. Going Vegan: In 2004, having spent several years reading about the harm caused by animal protein, I decided to do a 30 day trial of eating no meat, dairy, eggs or processed food to to see how I liked it. I loved it, lost a further 10 pounds, made some modest improvements to my colitis, and stopped getting sick. Not long after the end of my trial I decided to become a vegan permanently. Stopping All Complaints: I decided to stop complaining about anything for 30 days. I did it (I slipped up a few times, but quickly recovered), and reaped the mental rewards of a more positive life. It's amazing how things cease to be a problem when I can't complain about them. This trial reshaped how I deal with problems, which I wrote about in The Raw Food Lifestyle. Standing All Day: I decided to ditch my chair and do all my computer work at a standing desk for 30 days. Read about it here. Taking Full Responsibility: On this one I took the success of my 30 day trial of no complaining and went in an interesting new direction with it. I decided I could only blame myself for the vagaries of life, essentially altering my relationship to the world and others for the better. Do I see a problem? It's my fault and it's up to me to fix it, or not, as I see fit. Of course, all good things also stem from me as well. This perspective is a bit of a mind bender, but it's a wonderful one to try out. I also write about this topic in The Raw Food Lifestyle. Going Raw: Looking for a way to get rid of my colitis, I decided to try a low fat raw vegan diet. By the end of the 30-day trial all my symptoms were gone. Although I ate some cooked food afterward, within a year I had to admit to myself these foods were harming me, and I committed to a 100 percent raw vegan diet. Meditation: 30 Days of meditating 30 minutes a day left me more relaxed and mentally quiet. Currently I don't meditate every day, but generally will several times a week. No TV: My first few day without TV left me restless because I suddenly lacked society's default time waster. Over the course of my 30 day trial, though, I learned to fill the gap with friends, hobbies, books, athletics, and dozens of other activities. I still don't watch TV (although a few times a year I'll end up watching something at someone else's house because that's what they're doing) and really enjoy the change it's wrought in me. I few times a year I rent the full season of a show I've heard good things about and watch it all without commercials in rapid succession, but this is the exception rather than the rule. I find well over 95 percent of the TV shows I'm missing are pretty forgettable. I've written about giving up TV at length here. Learn to juggle really well: I can juggle a bit, but I want to get much better. Recover my back flexibility: I injured my back in September of 2009, and I want to recover all of my lost flexibility. Hold Handstands: I want to be able to hold a handstand for at least a minute. Natural Vision Improvement: I've experimented enough to see certain practices improve my vision, but I've never made a consistent enough practice to really see long-term benefits. Read an hour a day: You can probably wrap up a book per week or more at this rate. I've been regularly reading for pleasure and information since third or fourth grade, and consider it one of the best things I do. I usually read 1-3 books per week, although I've taught myself to read fairly quickly. Think of it as an investment in knowledge. Write something every day: Most people who say they want to write a book don't have a writing habit. Start writing a page of whatever you want every day and watch your ability soar. Learn a new vocabulary word every day: Studies have shown vocabulary to be a better indicator of the rank a person will attain at a company than any other factor. The higher their position, the better grasp of language that person has and the more words they know. The more words you know, the more nuances of reality you're able to perceive and understand. Makes you want to crack open a dictionary, eh? Go on a walk every day: Walking, especially if it's through a pleasant environment, is an extremely pleasant way to get the blood pumping. Sure it's not as ambitious as more strenuous exercises, but you've got to start somewhere. Give Up All Processed Foods: No soda, packaged foods, candy, chips, or any other junk food. 30 Days of better Health anyone? Meet someone new: Escape your rut and expand your circle of acquaintances. Every day go hunting for someone you don't know and find out their name, what they do, and strike up a conversation that lasts at least 10 minutes. You just might find a new friend. Become a great dancer: I have two left feet and don't even understand the concept of dancing in sync with music, but I have a feeling that, somewhere down the line, I'm going to have to make myself learn to tango. Sleep: Go to bed no later than 8 p.m. every night and don't get out of bed the next morning until it becomes impossible for you to fall back asleep (no cheating with caffeine). See what kind of changes getting adequate sleep brings about in your life. If you're having success with a 30 day trial, consider an attempt to improve your perception of the world by working on your mind. Read about a raw food diet here.